I know there have been mixed results with contact paper as masking. It did work for me so I thought I would explain my process. Hope it helps others. 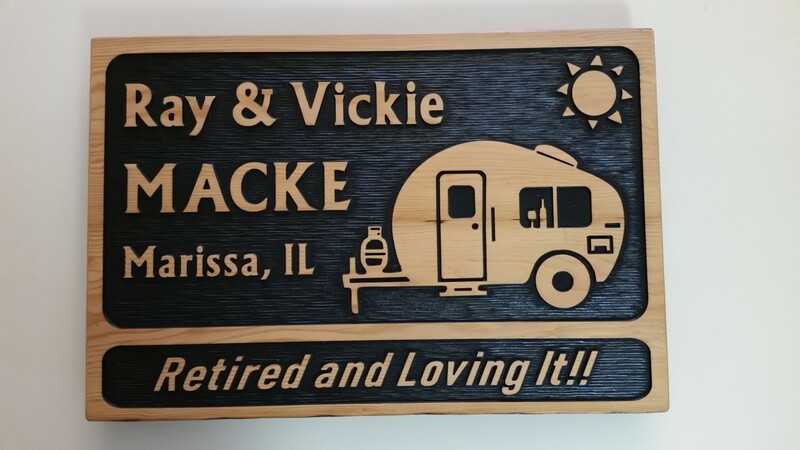 Seems many RV campers have welcome signs on their sites so I decided to make one. The size is about 14" x 21" X 1". Sanded smooth and then wiped on 3 coats of sanding sealer (shellac). Lightly sanded and one more coat which yielded a fairly smooth surface and a slight gloss. Then covered it with Oramask smoothing out almost all the small bubbles. The first attempt was a total fail! Used a 1/4" downcut bit to hog out the 1/8" recess for the textured background and it badly ripped the edges of the masking and chipped some of the smaller corners. Set it aside to plane down for another project. Repeated the above prep on a new piece but this time I used typical inexpensive shelf/contact paper as the masking. Figured it couldn’t be any worse than my first attempt. But I did cut it differently. I decided to first run a profile cut around all the text and objects using a 1/16" downcut. To my surprise, it cut perfectly clean. NO jagged edges of the masking or chips. Then I moved to the 1/4" bit for the actual rough out. That was followed by a ball nose for the background texture and again the 1/16" to clean up the details. I then hit the cut edges with a heavy coat of sealer and then not too carefully painted the black background with latex paint. Once dry, I peeled off all the contact paper and found ZERO bleed. Great! I then did 3 coats of satin spar varnish (2 brushed and the final sprayed). Have to say I was very pleased with how well the contact paper worked. But I am sure the profile outline cut with the small bit made the most difference. BTW - This was made from salvaged wood. The local power company replaced a bunch of big poles and cross beams from a cross-country section of high voltage lines. They were just scrapping them out. The beams were 7" x 5" and 10’ to 12’ long. Best I can tell they are douglas fir and I hauled 8 of them home. Heavily weathered on the outside but the inside they were straight tight grained and totally knot free - beautiful wood. I like the suggestion to run a trace of the design with a small bit first. I will be incorporating this into my own work! Looks great! How do you achieve the background like that? Vectric’s V-Carve and Aspire have a “Texture Toolpath” feature that makes developing this kind of background both quick and easy. I wanted a fairly fine texturing so I used an 1/8" ball nose bit with closely spaced elements. Worked great but took a little over 2 hrs to cut. Using a 1/4" ball nose and making it a little courser could have cut the time in half and still looked good.